NEW ORLEANS (CNS) — Boston Cardinal Sean P. O’Malley, one of eight cardinals appointed by Pope Francis to advise him on possible reforms of the Roman Curia, said Sept. 18 he has received extensive feedback from cardinals and archbishops in the U.S. and Canada in preparation for an Oct. 1-3 meeting with the pope. In New Orleans to celebrate Mass and preach at the Louisiana Priests’ Convention, Cardinal O’Malley said he did not know what to expect as a result of the gathering in Rome. Cardinal O’Malley said the group of eight cardinals will meet first among themselves at the end of September and then with Pope Francis, before accompanying the pontiff to Assisi Oct. 4, the feast of St. Francis of Assisi. Pope Francis established the so-called G-8 in April, giving it a mandate to advise him in the “government of the universal church” and his reform of the Roman Curia, the church’s central administration at the Vatican. Cardinal O’Malley said he has met personally with the cardinals of the U.S. and written letters to the archbishops of the U.S. and Canada, various groups of religious and other individuals asking for any suggestions or feedback. Cardinal O’Malley said he has been amazed at the way in which Pope Francis seems to have captured the world’s imagination in the six months since his election. Cardinal O’Malley said he was struck by the pope’s first trip to Lampedusa, where he threw a wreath in the water to honor thousands of refugees who had died seeking a better life. The southern Mediterranean island of Lampedusa is a major entry point into Italy for undocumented migrants from Africa. 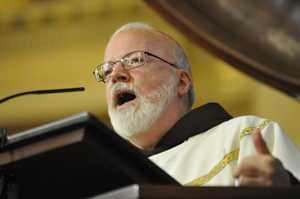 “In my life as a priest and a bishop, I think that’s the most quoted phrase from any pope,” Cardinal O’Malley said. “And, certainly, World Youth Day was probably the largest event in the history of our hemisphere, and it was just a great success. The Holy Father’s preaching is always so accessible.